Who’s Coming Up on Monday, March 21? “Everyone talks about it,” says Linda Oshiro. “Held in prison cell until this show,” says “unnamed”. “From Makana Music,” says Felicia Cowden. “Word of mouth,” says Charles and Phyllis McBeth. “Come this time of year purposely for Kanikapila,” says Teresa Cooper. It’s gratifying to know that EKK is a program that many look forward to and enjoy because GIAC and its many volunteers enjoy making it happen. This year, we had 52 persons with perfect attendance who came every week, and this number keeps growing each season. Topping off a stellar season with Willie K and His Band is definitely the Cherry on Top of a magnificent concoction. This 2016 Leap Year season has been an energizing year for EKK. 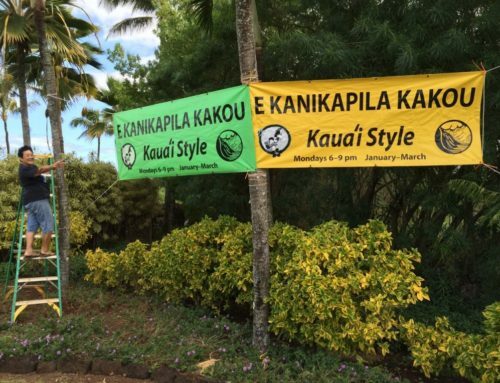 Many unexpected surprises, old favorites, new faces and renewed appreciation for the many loyal supporters of this program who have been really stepping up to the plate to show their support for EKK — unique in the islands and close to the heart of many. EKK 2017 or Bust! Mark it on your calendar and book your flights: January 16, 2017 – March 20, 2017for the 34th year of EKK. When Sean Na`auao first requested an appearance on EKK, he said he wanted to perform with his son Kupu`eu as a father and son team, so that was the original plan. As their date approached, he disappointingly said his son had to take a standardized test for school so could not come. At the last minute, he said that his Leap Year Surprise was that his son could, after all, be at EKK by taking the test on an alternate date. So Sean showed up at EKK with his son Kupu`eu Dalire-Na`auao. He looks like a high school freshman, but musically, he has to be older than that. As part of the musical group Hu`ewa (pronounced Whoevah), Kupu`eu and his youthful partners walked away with two coveted Na Hoku Hanohano awards in 2015 – Most Promising Artist of the Year and Group of the Year, so naturally, Sean is very proud of his son’s budding musical career. 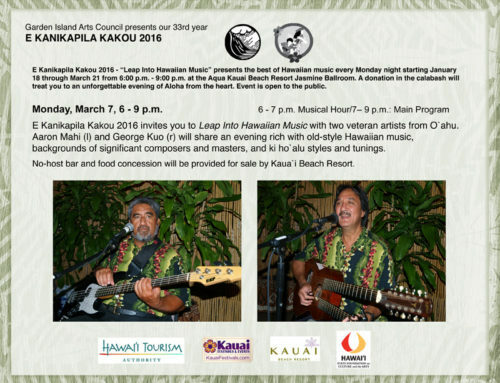 The first half of the program was geared toward featuring his son’s music as well as songs from his own latest CD, Lehua Beauty. Their version of Dennis Kamakahi’s Koke`e was a true duet as they went back and forth, each singing the lines solo and then in unison. What a unique voice that young man has. Most of the songs featured in the beginning were songs composed by Frank Kawaikapu`okalani Hewett, who happens to be a cousin of Kupu`eu’s mother, who is the daughter of the late Aloha Dalire, who was the first Miss Aloha Hula at the Merrie Monarch Hula Competition. Aloha Dalire’s three daughters were also crowned Miss Aloha Hawai`i and carry on the hula legacy of Keolalaulani Halau `Olapa o Laka. Sean began with Frank’s popular Ka Pilina, which was the Song of the Year at the 2001 Na Hoku Hanohano Awards and the song that he taught the `ukulele circle. 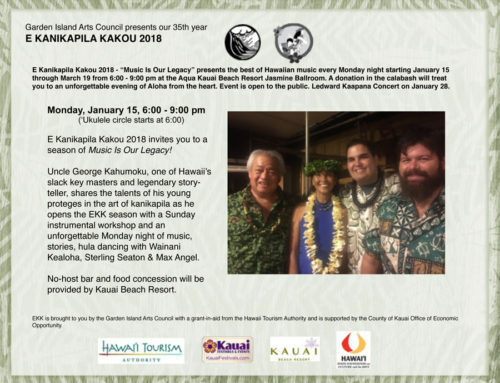 He called on a long time friend, Ku`upua Kamealoha, also known as Pua Gomes, who had performed as the kumu hula representing Kanuikapono Hawaiian Charter School on Community Hula Night. Many of Frank’s songs have become hula standards not only here in Hawai`i but wherever hula has taken hold, because his songs give hula dancers so much to work with in expressing the lyrics. They sang a medley of two popular hula songs, Ka `Eha Ke Aloha and Ka Wai Lehua A`ala Ka Honua. Kupu`eu took the solo lead on the second song and his voice was quite unique. They finished the set of Frank’s hula songs with E `Ike I Ka Nani a o Hopoe. Turning the spotlight on Kupu`eu, the music took on a youthful upbeat tempo. Their version of Ke Aloha was quite different from the usual song played for hula dancers. Kupu`eu took the solo lead for their animated version ofKa`ililaukokekoa. Sean’s Dad was part of the Hawaiian Airlines promotional team that traveled all over the world, so the legacy lives on with the next generation and the next. They sang The Royal Hawaiian Hotel; it sounded very different from other versions because Sean put his own Na`auao stamp on the song. Sean shared the story about Kupu`eu who traveled all over the world with his performing parents since he was age three, carrying and strumming his small Duke Kahanamoku `ukulele wherever he went. It was one of those small kid’s instruments from WalMart or Woolworth’s way back when. Over the years he graduated to his own real instrument and tonight he was going to show his skill on Sean’s guitar. Kupu`eu is a left-handed bass guitar player, while Sean plays on his regular guitar. When they switched instruments and Sean took on the bass and Kupu`eu strapped on the guitar, it was pretty amazing that the song comes out right and not backward. I had to wrestle with some brain gym exercises trying to figure out how he plays the instrument upside down and still has the song coming out right side up. When they got to Noho Paipai they were really getting into the groove and their spontaneous jam with Kupu`eu on the guitar and Sean on the bass really got the audience jazzed up; they showed their appreciation with hana hou shouts. Sean even had a hana hou song to sing. This boy is so talented, he not only plays the instrument, he knows how to play with the crowd. I guess if you start at age three doing musical tours, some of this stage presence has to rub off on you. After they sang another song off Sean’s new Lehua Beauty CD, Kupu`eu started to play the Kamoa `ukulele that was going to given away, so Sean ended up with a guitar in one hand and a bass on his lap. “We are trying to be as talented as we can, holding a guitar in one hand, a bass in the other, and trying to sing at the same time,” joked Sean. But then they pulled it off with a song that is very special to both of them, the very beautiful himeni, `Ekolu Mea Nui,that many in the audience knew and could join in. 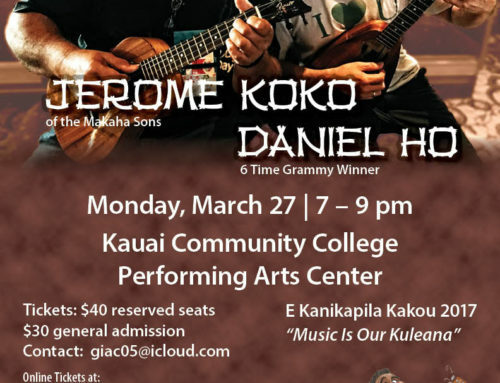 After the intermission, the CDs were given away and one of the CD winners was also the winner of the Kamoa `ukulele. An elated Terry Roberts from Texas was beaming the whole rest of the evening for scoring double in the good luck category. All it took was a minute to fill out the attendance form to win a great CD and about two minutes to sign up for the `ukulele giveaway. The second half took on a mellow and audience-interactive mood as the duo sang songs that enticed the hula dancers in the house to step up to the stage. A beautiful rendition by Sean of My Sweet Lei Poina`ole was danced by Kainani Viado; Sean’s voice is so full and rich when he sings the hula songs. It’s no wonder he is so popular as a musician playing for the hula halau. Kainani also danced to the next song. Queen Lili`uokalani’s song, Queen’s Jubilee, written for Queen Victoria, is one of her most beautiful songs. It was written in April 1887 when her brother King Kalakaua asked Crown Princess Lili`u to accompany Queen Kapi`olani to Queen Victoria’s 50th year of her reign as Queen of England. The Hawai`i contingent returned to Hawai`i in July 1887. As Sean and Kupu`eu sang it from the stage, Kamala Mersberg from the back of the audience was joining in with her heartfelt best, her voice soaring throughout the ballroom. The song really moved her as it did everyone else. Vern Kauanui, our resident hula dancer, requested two hula songs so he could shine on stage. Nani Kaua`i is a song that Sean recorded with Sistah Robi. Somehow with the combined instrumental accompaniment by both musicians, it had the sound of a big screen soundtrack. Vern also requested Waikiki, written and recorded by Andy Cummings. “I forget the words,” confessed Sean but he was able to sing it with hula dancer Vern calling out the words for each line. Not to be outshined by Vern, four lovely hula dancers – Ina Lejins, Madeleine Guyett, Mahina Baliaris and Yumi Teraguchi — each danced their own choreography to Ke Aloha, a hula favorite, while Sean and Kupu`eu kept true to the Na`auao beat. By this time, the hula dancers were raring to get up on stage and the air was electric with hana hou shouts. Sean sang Edith Kanaka`ole’s Ka Uluwehi O Ke Kai, the seaweed song. Madeleine, Ina, Mahina and Kainani were joined by Elena Gillespie, Alex Nelson and Fran Nestel. It’s always interesting to see how many different hula interpretations are danced to the same song. As the final EKK Monday of 2016 started to wind down, Sean and Kupu`eu sang the title track to Sean’s new Lehua Beauty CD. Sean called out, “If you don’t hana hou us, we will hana hou ourselves!” Hana hou! Hana hou! Of course, Sean had to throw in his parting shot with his well-known Fish and Poisignature song. With the singing of Hawai`i Aloha, folks joined hands for their final EKK session of 2016, happy for the opportunity to enjoy Hawaiian music at its best. If you have a disability and need assistance for Monday events please email Carol Yotsuda atgiac05@icloud.com.